Preheat your oven to 350F degrees and place the torn bread in a large bowl. In a small saucepan heat the butter until it has melted. Whisk the mustard and salt into the butter and pour the mixture over the bread. Toss well, then turn the bread onto a baking sheet and bake for 10 – 15 minutes, or until the croutons are golden and crunchy. Toss them once or twice with a metal spatula along the way. While the croutons are toasting, melt the butter (or olive oil) in a large saucepan over medium-high heat. Stir in the shallots, onion, and a big pinch of salt. Saute for a couple minutes. Stir in the potatoes, cover, and cook for about four minutes, just long enough for them to soften up a bit. Uncover, stir in the garlic, then the broth. Bring to a boil, taste to make sure the potatoes are tender, and if they are stir in the broccoli. Simmer just long enough for the broccoli to get tender throughout, 2 – 4 minutes. 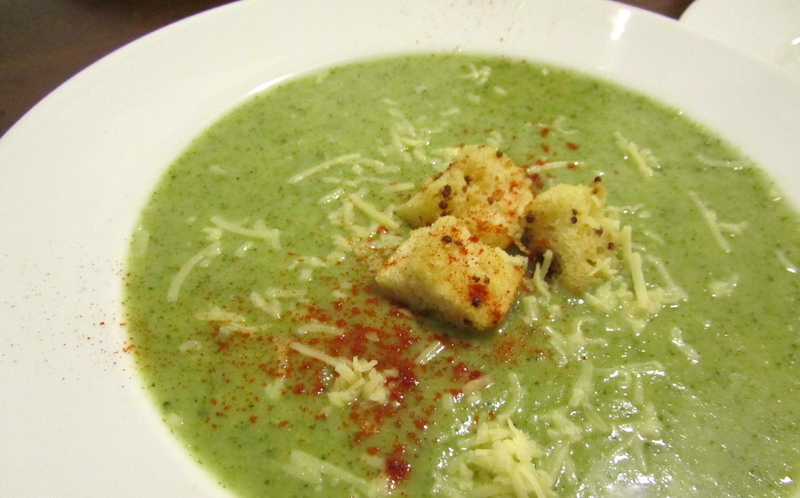 Immediately remove the soup from heat and puree with an immersion blender. Add half the cheddar cheese and the mustard (a little bit a a time). If you are going to add any creme fraiche, this would be the time to do it. Now add more water or broth if you feel the need to thin out the soup at all. Taste and add more salt if needed. Serve sprinkled with croutons, the remaining cheese, a drizzle of olive oil, and a tiny pinch of smoked paprika. This entry was posted in cheese, soup, vegetables, vegetarian and tagged broccoli, cheddar, soup by Laura Zolnoski. Bookmark the permalink.